The Pasta ala Checca "recipe" was shared by a nurse that I used to work with. Just minutes to prepare, and full of flavor. Never thought to blog about it until I saw a similar recipe on Savoring Time in the Kitchen. Another summer pasta dish that I make quite often is from Giada DeLaurentiis, and is called Spaghettini with Checca Sauce. Tonight I made Pasta ala Checca, and added some herbed breadcrumbs as mentioned on Savoring Time in the Kitchen's blog. Using homemade croutons, I put them in my food processor with a several basil leaves and minced into breadcrumbs. The herbed crumbs are a nice addition. Place fresh, chopped tomatoes and basil, minced garlic and olive oil in a bowl and let the wonderful flavors marinate for the day. I add a little sea salt. 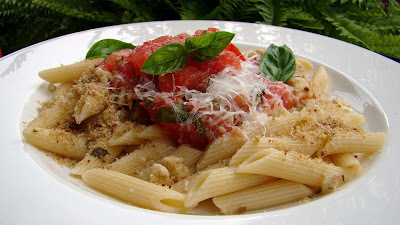 Serve over warm pasta with grated parmesan and herbed breadcrumbs. That's it! Sometimes I add a meatball or Italian sausage to the plate. 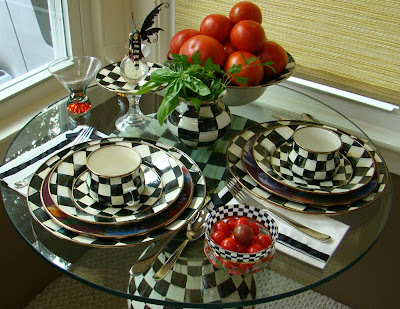 You may recall that I recently went to the Mackenzie-Childs Barn Sale and bought a Courtly Check table. Even though I don't have the chairs yet (they are on order), I decided to set the table tonight. The center piece is the abundance of tomatoes and basil that I will be using this weekend to make sauce for the freezer. Do you spy that little chandelier? I was shopping with the girls around the time of my birthday, and found it in a cute little shop. It will always remind me of a special day in Sharon Springs with the girls. Thanks for the mention, Debbie! 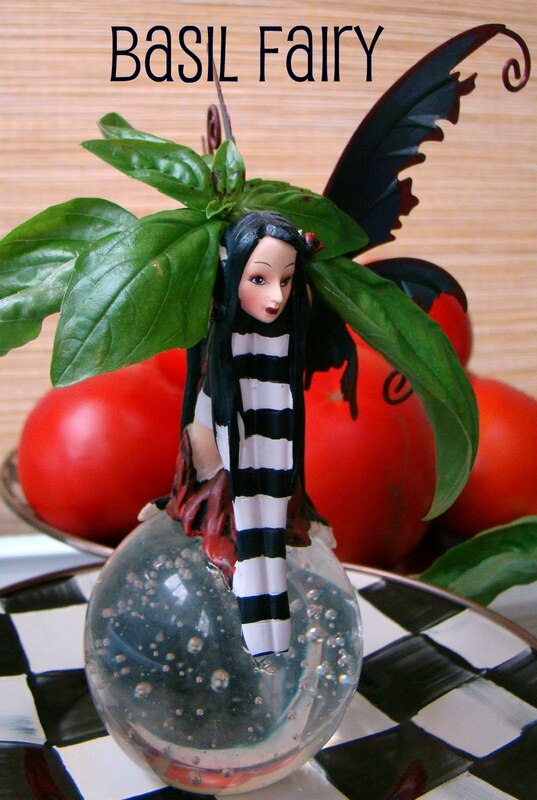 I loved those herbed crumbs - something I've never tried before with pasta. I will be making this dish several times while my tomatoes are ripening. 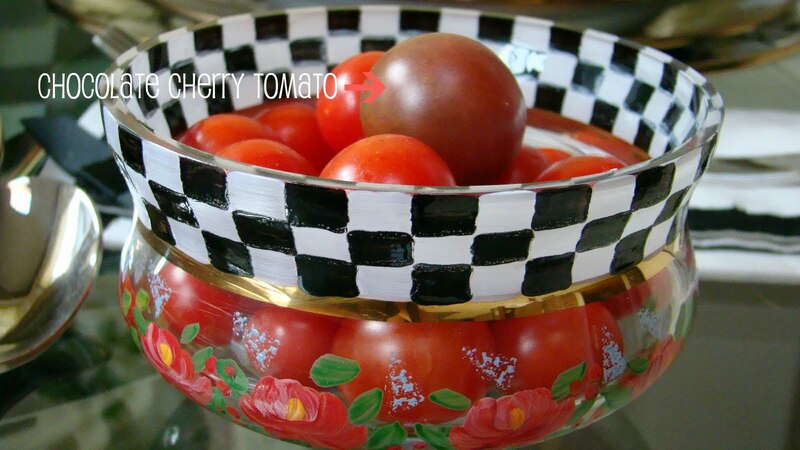 I don't have one ripe chocolate cherry yet :( but my Tumbling Tom is going gangbusters. 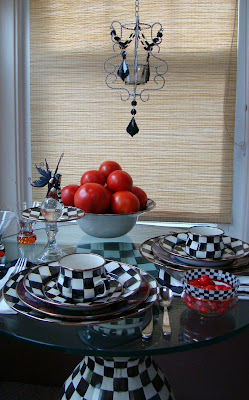 I love your MC tablescape, Debbie! 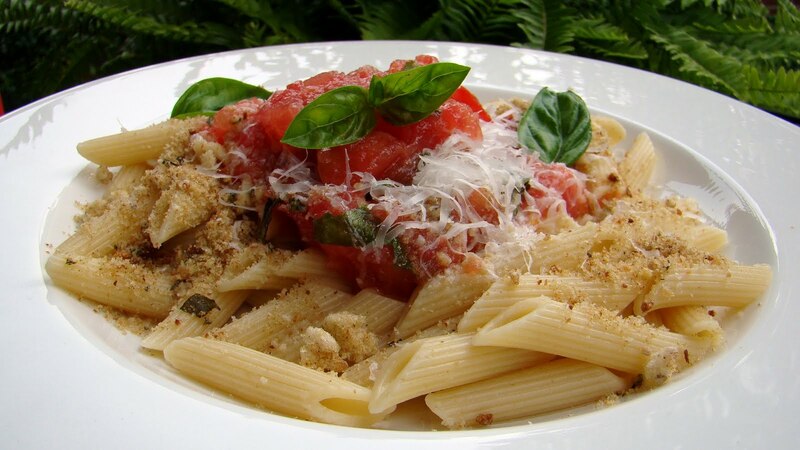 The pasta looks delicious...I have just started using seasoned breadcrumbs, don't know what took me so long. The table is so pretty! And I love the centerpiece, even though I don't eat fresh tomatoes, I do think they are beautiful! The pasta looks good too! I always mince up some fresh herbs in the breadcrumbs. It gives it such a summer taste even in the dreaded winter! Cute jars for the smores, I bought those giant marshmallows at CTS too, and the big sticks! Now where did I put them? I'm new to your blog Debbie but I love it already. The colours alone are amazing, even before you get to the content and recipes. Here in Melbourne I've just planted my tomatoes, so I must be patient and I'll have a little wait, but I'm hoping for a good harvest, fingers crossed. Well, girl, it took me 5 minutes to get back up off the floor and into my chair after I fainted when I saw your beautiful table. You always throw me into CC LUST.. The food looks fabulous, too. LOVE your new MC table, Debbie--so adorable! Hey, I can't leave comments on my own blog for some strange reason, but I wanted to tell you those ball topiaries on my front porch are from Lowe's, and I think they're little cypress trees. Deer LOVE them, so I keep them up high, out of their reach. Hope that helps! Why didn't you link this to Tablescape Thursday? It is so pretty!